The same way rubber is the best material for tires, and copper is the best conductor for electricity, propane is the best fuel for forklifts. This great industrial pairing is a near perfect combination as propane-powered forklifts have become the most economical way to service material handling needs in 2019. Today there are almost three quarters of a million propane forklifts moving goods in warehouses, manufacturing facilities, and freight terminals across North America. Nobody there or anywhere else on planet Earth disputes that propane is a preferred power source for material handling. But it wasn’t always so cut and dried; the forklift industry and the propane industry both had to grow-up together, and then get married. Walter O. Snelling made and sold propane for use heating and lighting homes in 1912. The first mention of energetic gasses trapped in petroleum comes from the American scientist Walter O. Snelling. In 1910 the American chemist labeled components of gasoline as being ‘wild’, and he set about capturing the wild gas (LPG) and putting it in a steel bottle. The story is that he was responding to an early automobile owner’s complaint that his petrol evaporated too rapidly. So the scientist filled a glass jug with gasoline from a filling station and discovered, on his way back to the lab, that vapours had formed in the jug which were so strong they caused the cork to pop out. Using a simple hot water heater and some other easy-to-obtain pieces of lab equipment, Snelling built a contraption that could separate or further refine the crude gasoline of the day into its liquid and gas components. The March 31st, 1910 edition of the New York Times quotes Dr. Snelling, who said, “…a steel bottle will carry enough [gas] to light an ordinary home for three weeks.” Snelling then went to work founding the propane refining and distribution industry. As early as 1912, just two years after its discovery, the famed American scientist started making and selling the fuel at the world’s first propane production and distribution center, and in 1913 he patented a process for producing propane on an industrial scale which he later sold to Frank Phillips, the founder of the ConocoPhillips oil company. Masterlift contends that the forklift originated in UK shipyards. American history doesn’t necessarily agree, but we Canadians know the Brits had been moving heavy loads on mechanized dollies in and around steel mills and UK railroads before the 1906 debut of the battery powered platform trucks that the Pennsylvania Railroad introduced for moving luggage at their Altoona, Pennsylvania train station. Many American historians credit this battery powered baggage cart as the first forklift. But UK shipyard innovations in combination with the massive industry that was the British Navy led to freight handling mechanization that more-resembles forklifts, and much earlier, but that is not the subject of this post. Ransomes, Sims & Jefferies Ltd made early battery-powered handcarts for UK railroads. The distant ancestors of the modern forklift were stationary, manually powered hoists that were used to lift loads which had to be brought to them. World War I saw huge demand for portable freight loading devices that could help people load supplies for troops in a short period of time. The war did many things for modern industry but it also allowed for an exchange of ideas among the allies. World War I brought about huge advances in material handling technology and equipment in the United Kingdom, most noticeably by Ransomes, Sims and Jeffries of Ipswich. They needed to change their ways because of the labor shortages caused by the war; suddenly they didn’t have twenty guys to haul on ropes or even enough people to feed and care for draft horses. 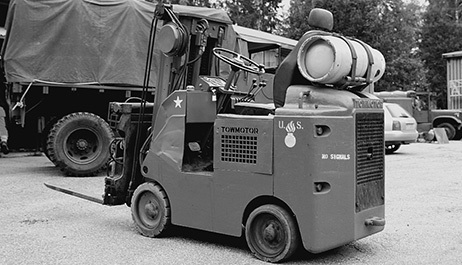 It’s no coincidence that right after the war, American manufacturers, Clark and Yale & Towne entered the lift truck market. Forklifts continued to be experimented upon and further developed throughout the Roaring Twenties. 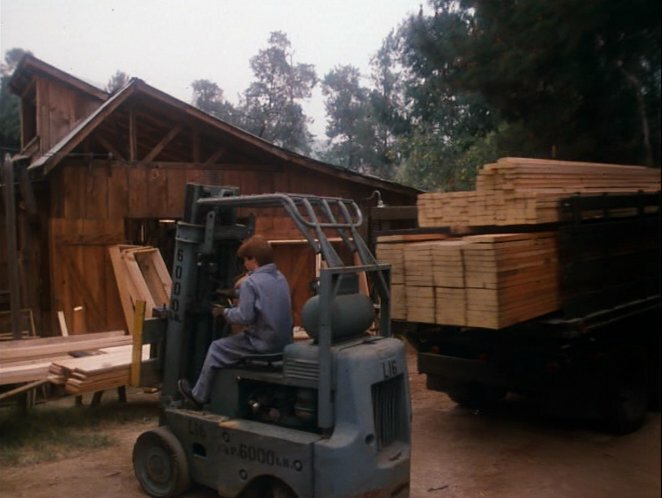 Below is a scene from The Waltons which shows a gasoline powered 1943 Clark Utilitruc loading fresh cut lumber at the local sawmill at the base of Walton’s mountain. 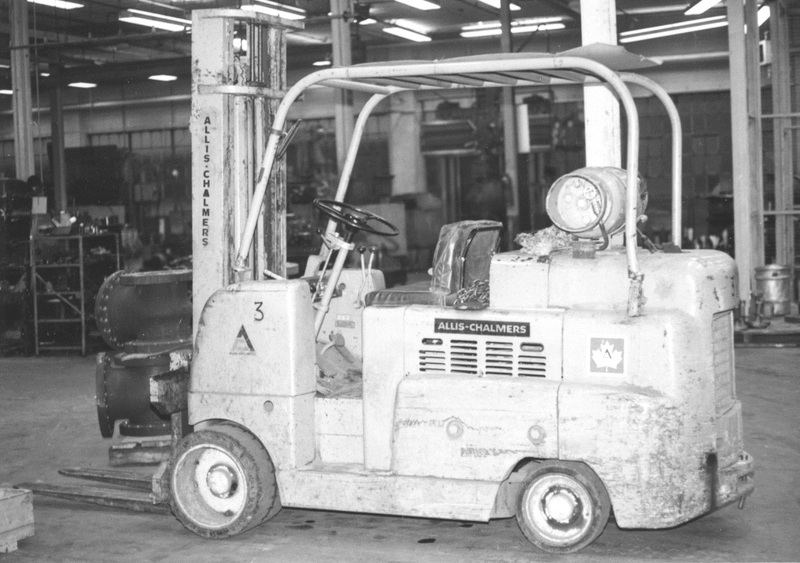 The first propane powered forklifts appeared in the 1950s. CLARK introduced their nested I-beam upright innovation in 1956 which they called the Clarklift. This could be either gas propelled or propane, or electric. Their new upright design dramatically improved the machine’s lifting strength and load stability and was very popular in the marketplace. The propane powered version was among the top sellers in those parts of the world where the gas was more commonly available to consumers. 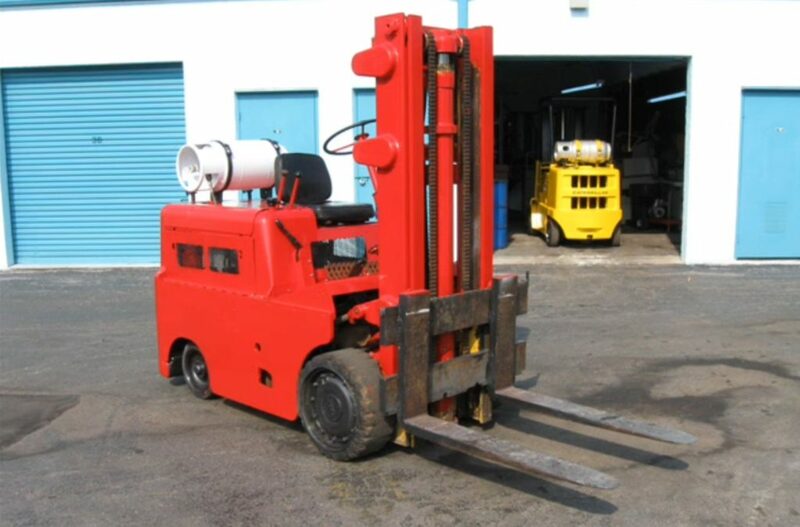 The 1956 Clarklift seen above was the first of a complete line of internal combustion and electric powered fork lift trucks that were very popular. This design dominated the materials handling industry for a decade between 1956 and the mid nineteen sixties. Below is a freshly restored and painted 1961 Clark Utilitruc (which was originally an odd coloured orange that I suppose could not be matched today). Anyone with any experience can usually date forklift models at a glance simply by studying the shape of their bodies, and the bench (the chair) and the inclusion or absence of certain safety features like the operator cage. Then in the 1960s , these standard industrial cylinders were upgraded to a three-piece steel cylinder with the DOT designation of 4BW-240. Most industrial cylinders were made of steel until the introduction of the DOT 4BE-240 aluminum cylinder in the early 1970s. Aluminum is much lighter metal than steel, and the cylinder weight was almost cut in half- the average empty weight of a 33-pound cylinder went from about 42 pounds to 22 pounds. Featured Image is an Allis Chalmers forklift from the early 1960’s. This propane powered lifting machine has a 10,000 lb capacity! Allis Chalmers forklifts was founded in 1901 in Milwaukee, Wisconsin and the company was a significant manufacturer of tractors and forklifts until it floundered in the ’80’s and was finished in 1987. Propane powered forklifts continue to be desirable, especially with higher EPA emission requirements causing lower emissions. But look out propane, electric trucks are gaining momentum at a faster rate every year.